haha. thanks ML, for the link! for all of you who dream of going to africa one day like me, here you go! how to survive an ostrich attack. 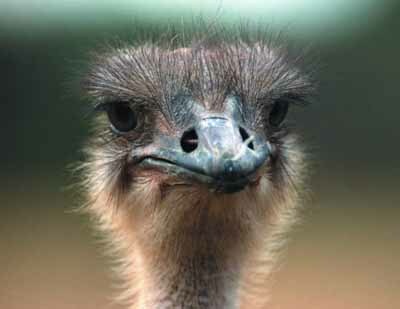 i actually worked with ostrichs in denver. her name was omlette, and she was quite sweet. we could go in her pen with her and with the male, named hamlet. she was totally facinated by the small holes on my belt. so i would be walking up to her, and BAM she'd bend down and peck my belt hard enough to nearly knock me over. it was a bit terrifying, especially in the summer months, with all the exposed skin on my legs and arms. although i guess a bruise from an ostrich pinch is better than being disemboweled by their sharp nails.